The ship rests about 20 yards from a parking lot located near the shoreline, York Police Department Detective Matthew J. Calcina told The Washington Post on Monday. The revolutionary ship rests about 20 yards from a parking lot located near the shoreline. Washington: Every now and then, a storm ravages the coast of southern Maine so totally that it provides a glimpse of colonial history. The recent nor'easter that killed eight people also excavated sand from the coastline of York's Shore Sands Beach, revealing the hull of a Revolutionary War-era ship, its remaining planks protruding from the sand like the ribs of a starving dog. 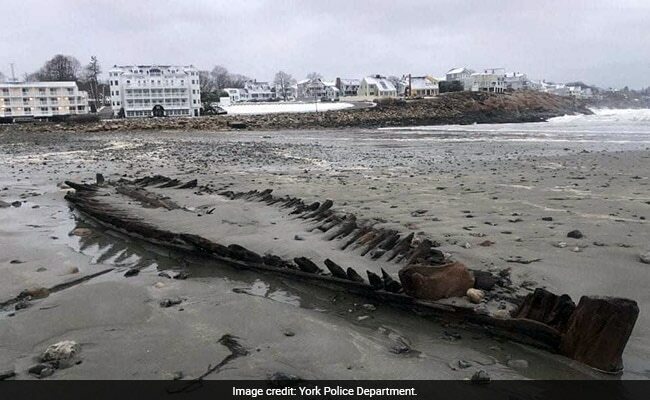 The ship rests about 20 yards from a parking lot located near the shoreline, York Police Department Detective Matthew J. Calcina told The Washington Post on Monday. He snapped a photo of the ship, with snow-capped hotels and homes in the background. And this isn't even the first time this has happened with this particular ship, the department wrote on Facebook. The ship has become a local point of historical pride, revealing itself only after devastating storms. The wreck was visible in 1958, leading to speculation about its origins. Then two decades later, another spring nor'easter provided a closer glimpse of the vessel. "Based on the type of construction, marine archaeologist Warren Riess hypothesized that the vessel is a sloop of about Revolutionary War age," Sharon Cummins wrote for Seacoast Online. Another storm did the same in 2007. "The old relic appears infrequently, adding to its mystique," Cummins wrote in 2013. "Each time, roughly once every decade or two, new maritime history buffs are born." Sloops played an important role in the early days of the Continental Navy. The ships, armed with cannons and swivel guns, harassed Royal Navy warships that delivered supplies and menaced revolutionaries on the shore. One sloop, the Success, was involved in one of the first naval battles of the war on May 14, 1775, just 25 days after the opening shots of the revolution at the Battle of Lexington and Concord. Capt. Nathaniel Pope and Capt. Daniels Egery led a small force in capturing two British sloops and their crews, the Naval History and Heritage Command wrote. Those ships mirrored the Army's inexperienced upstart nature. Many ships then were private vessels given a letter of marque - essentially permission to attack foreign vessels that would otherwise be illegal piracy. That emboldened local Capt. Jeremiah O'Brian, whose crew of men from present day Machias, Me. climbed aboard the Unity sloop and captured the crew of the HMS Margaretta that June. O'Brian hunted up and down the Massachusetts coast during the war, the command said. Overall, the Continental Navy did not experience much success, because of inexperience and ineptitude in the face of Britain's naval forces, the command noted. But their few victorious skirmishes and tall tales chipped away at the seemingly omnipresent image of the powerful Royal Navy, then the world's finest. In addition to the Maine sloop, modern storms have been a boon to historians, scientists and archaeologists who traverse the depths to solve confounding mysteries. The last known slave ship, the Clotilda, was burned and partially buried off the Alabama coast in 1860. Its final resting place was a mystery until a January storm system that included a bomb cyclone swept away water and mud like rock dust from a fossil, revealing what is likely the ship. And after Hurricane Harvey pounded the Texas coast, a beach was introduced to a new horror near Galveston: A faceless, sharp-toothed sea creature that looked like a prehistoric oddity to some. It turned out to be a fangtooth snake-eel. And yet, with the several appearances throughout the years, not much is known about the uncovered sloop. The Maine Historic Preservation Commission declared it an archaeological site. But a database search of 2,500 shipwrecks across the globe, from the Revolution to the nuclear age, did not return any records indicating it was a known American sloop, Navy history command spokeswoman Sandra Gall told The Washington Post on Monday. The records aren't entirely comprehensive, Gall noted, so the command could not weigh in about its origins without further investigation. There is apparently no history or description of its captain or crew, or how it ended up on the bottom of Maine's frigid waters. It could even be a hapless Royal Navy vessel, the victim of a rare Colonial victory. But for now, it's just known by the historic commission's classification. ME 497-004 was found, and will be swallowed up again when the tide returns. Until the next big storm.